Presenting our 9th warrior, Eli! “Eli was born October 27, 2010 after an uneventful pregnancy. He was 8lbs 12oz, 21 ½ inches long. He had chubby cheeks and a bottom lip that quivered with his cries. 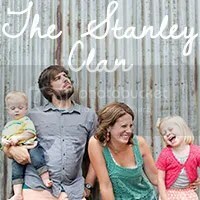 Our first few weeks as a family of four were full of happiness. As time went by, there were a few things we noticed about Eli that just didn’t quite add up. Individually, nothing was of major concern, but as we were making a list of things to talk about at his 2 month check up, the combination was worrisome. At the doctor’s office, the first thing they did was weigh him. When the scales showed 8lbs 5oz, I insisted the scales be zeroed and to reweigh him. Unfortunately we got the same answer; at exactly 10 weeks old he was 7 ounces less than his birth weight. Something was seriously wrong with our baby. We initially thought it was a gastrointestinal (GI) problem because of the weight loss accompanied by some of the things we had on our “list.” A chest x-ray was done and it showed an enlarged heart. That could have been secondary to a GI problem or it could be a cardiac issue. Further testing would reveal more answers. It was decided to transfer him that night to a larger facility an hour away so we would have more availability to specialists as we worked through this puzzle. Eli was taken by ambulance with a Pediatric Intensive Care RN, a respiratory therapist and an EMT. Bryan and I went home to pack a few more items since we’d be an hour away from home instead of 5 minutes. We also needed to see Zachary (our older son who was 3 at the time) before we left. Eli arrived about midnight and Bryan & I got there shortly after. He was stable and testing was scheduled for the morning. Unfortunately his heart rate dropped several times in the night and it was decided to proceed with the echocardiogram at 3am. The pediatric cardiologist examined him for a long time. Then she sat us down and started drawing pictures. The first was a picture of a normal heart and its blood flow. Then she drew Eli’s heart; drastic differences. Under her recommendation, Eli was transferred by helicopter that afternoon to Peyton Manning Children’s Hospital at St. Vincent in Indianapolis. We had heard of it and also figured she did this more than we did, so we’d go with what she suggested. Eli arrived before we did. By the time we got there he had been admitted (his third hospital in less than 24 hours! ), had a bath (he threw up after the flight) and had been seen by the PICU intensivist and two pediatric cardiologists. Another echo had been done and the doctors were ready to talk to us about their findings. Eli was born with multiple heart defects: Tricuspid Atresia, VSD, Transposition of the Great Vessels, and Coarctation of the Aorta. Basically our little boy was dying and our only chance was open heart surgery. All this was on Thursday. 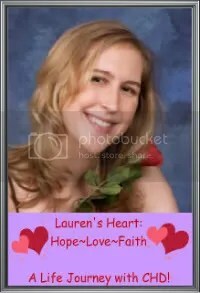 The cardiologists & surgeon had developed a specific surgical plan by Saturday and surgery was scheduled for Monday, January 10. We met his surgeon, Dr. Simon Abraham the day before surgery. When we met, we all shook hands. To this day I remember the chill that went through my body as I touched his hand…the hand in which we were placing what was left of our baby’s life. He was very thorough about the risks and problems we were facing. The surgery (a modified Norwood) is very complicated and risky, but even more so for Eli. 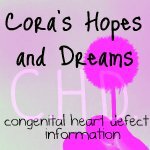 We were told most babies with his defects are diagnosed during pregnancy. The few that aren’t usually have problems at birth and are diagnosed within hours of delivery. The longest anyone we spoke with could remember a baby surviving at home before being diagnosed was 5 days, and medical personnel were amazed at that. Eli was 10 weeks old. They couldn’t believe he was without symptoms for that long. You would think that being a little older would be an advantage before surgery, but not in this case. It was actually complicating things because his heart had worked wrong for so long and was so enlarged. His condition was rapidly deteriorating. There were major differences between the Eli we saw in Indy from the Eli we had at home just a few days prior. Zachary was with us for a few hours on Sunday and gave Eli (and us!) lots of kisses. Then he was taken back to Washington and we spent the night saying goodbye to our baby who was still so perfect in our eyes. Dr. Abraham had said there was a 1 in 3 chance Eli would not make it out of the operating room. Of course we were hoping & praying for the best, but we had to prepare ourselves for the worst. Even if he made it out, we were told he’d be on ECMO, a machine that acts as his heart and lungs and pumps his blood for him so his organs can rest. 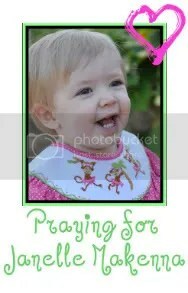 Our prayers were beyond answered when Eli made it out of surgery & was NOT on the machine. His heart was beating on its own. He was on a ventilator and had 493,271 tubes & wires attached to him, but we didn’t see any of that. We only saw that perfect baby boy whose chest was moving with his own beating heart. Hours after Eli’s Norwood procedure. We were so happy he was alive that we barely saw all the equipment for our sweet little baby. He was off the ventilator by Thursday night. He was out of the PICU and in a regular room eight days after surgery. We left the hospital exactly 3 weeks after he flew there. Our original expectation was to be in PICU for 3 weeks. I guess Eli didn’t get that memo! The only “complication” was that he didn’t want to eat. He only wanted his pacifier. We had to feed him through a tube that went into his nose, down his throat & into his stomach. Bryan & I changed that weekly for a while, but opted for another surgery in February to place a feeding tube directly into his stomach. That was a tough decision for us at first, but now we know, without a doubt, we did the right thing. Eli being held by Cody Zeller (current Indiana University big man) after Cody’s high school team won regional his senior year. Feb 11, 2011, a few days before surgery to place his feeding tube. The nurses always talked about how “laid back” Eli’s demeanor usually was. He’s the only 3 month old I’ve seen lay with both hands behind his head and ankles crossed. September 7, 2011 a few days after Eli’s Glenn surgery. Eli’s second heart surgery was on September 1, 2011. That was his Glenn or Hemi-Fontan. Eli was so much healthier going into this surgery and, of the three he will require, this one is the “easiest.” The risk of death was estimated to be 1-2%. Of course we were still worried, but also felt that he was as ready as he could be for it. Again, he did wonderfully. He was off the ventilator 12 hours after surgery (actually a little longer than they had estimated he would need it). He did have some fluid on his lungs, but that was taken care of by medicine so we didn’t have to place a chest tube to drain it. His heart rhythm changed during surgery, so a temporary pacemaker was placed while he was in the OR. Eli’s heart was in a junctional rhythm. During his recovery, he would return to a junctional rhythm every time the pacemaker was turned off. It’s something one can live with, but it’s not ideal, especially for a baby with only one working ventricle. As of now he’s still in a junctional rhythm. The only way to fix that is with a pacemaker. Overall his recovery from the second surgery was great. Surgery was on the 1st and he was home on the 9th. It would have been sooner if not for the heart rhythm issue. 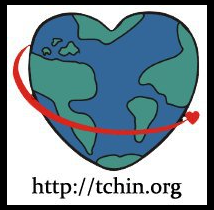 Later this month, Eli will have another echo and EKG to determine when his Fontan completion will be. His oxygen saturation is consistently in the mid 70s these days and he’s been steadily gaining weight. Right now we’re guessing his surgery will be in the spring or possibly summer 2013. He will have the pacemaker placed at that time as well. Eli’s 1st Birthday photo! Yea, we didn’t know if we’d see this day or not and here we are! To look at him, you’d never know what he’s been through. You’d never know how special his heart is. You’d never know how many hours of physical, speech, and occupational therapies he’s had because he’s now walking, talking, and eating like most other two year olds. You’d never know how many people and prayers it’s taken just to have him with us today. If you saw him today, you would see a chubby cheeked two year old who adores his five year old brother. You’d see a beautiful brown eyed boy with an infectious laugh and feisty streak a mile wide (we think that feistiness a big reason he’s done so well!). You would see Eli, not his defects. But believe me, they are there. Eli’s defects are not correctable. The goal with these three surgeries is to make his heart as functional as possible for as long as possible. We are buying time. He will probably require a heart transplant at some point, which brings along a whole new set of concerns when/if that happens. We’re hoping for more advances in the field of pediatric cardiology that would allow for other options, thereby postponing or eliminating the need for a transplant. 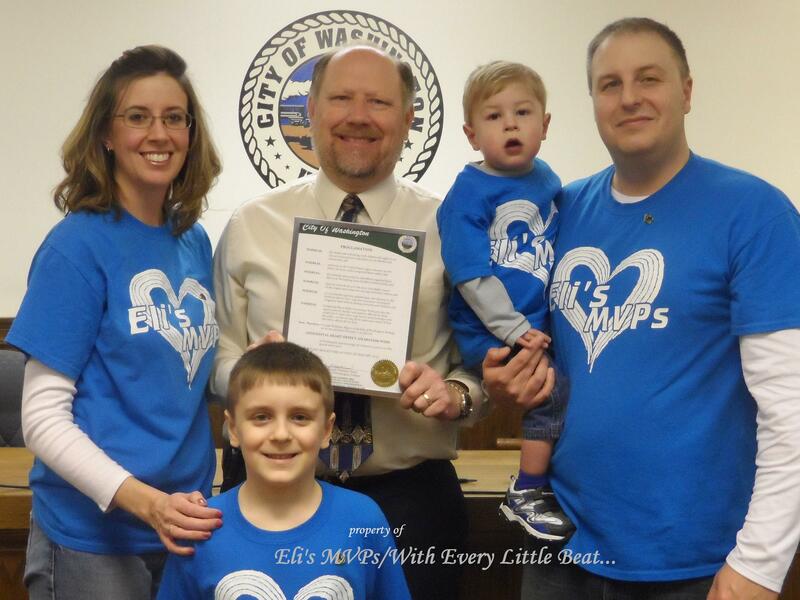 Receiving the Proclamation for CHD Awareness Week from our mayor! And now, hope over to Eli’s freshly pressed Facebook page! It’s called: Eli’s MVPs! How cute is that?? 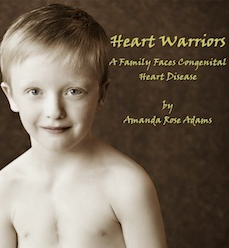 Let’s spread CHD awareness like crazy and help to support this loving family!